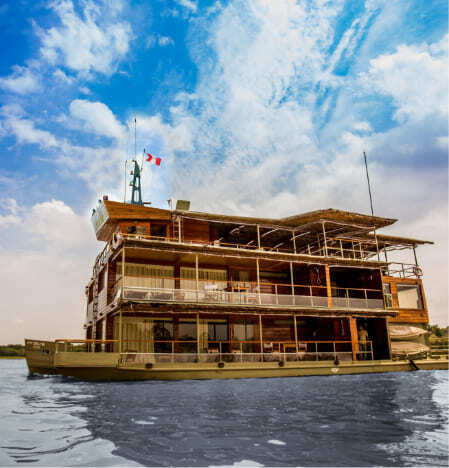 Only the best Amazon cruises can guarantee you an unforgettable experience that expertly combines an adventurous spirit with your standards for luxurious comfort. When you embark on an Amazon cruise with Delfin Amazon Cruises, you’ll engage in an award-winning experience that only the best Amazon cruises can provide. From comfort to sustainability, lush rainforest landscapes to the snaking river, a luxury cruise with Delfin is the best Amazon cruise for those wanting to feel at home and out of this world. 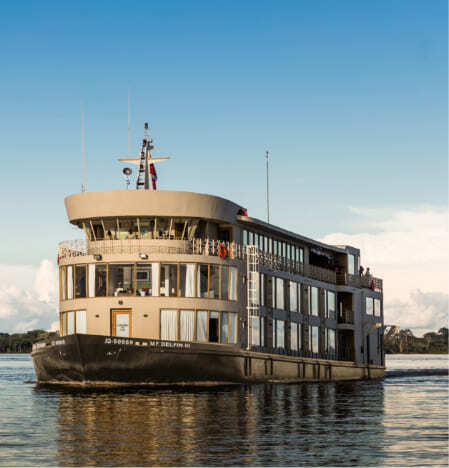 As the world’s first cruise company to become part of Relais & Chateaux, Delfin Amazon Cruises’ standards for design and service have driven the company to become one of the best Amazon cruises. In fact, Delfin’s line of boutique cruise ships has been recognized by Conde Nast Johansens as Best Waterside Hotel in South America (2016) and Best Service in Central & South America (2018). The fleet of luxury Amazon cruise bathe in light during the day and reveal silhouettes of the jungle by night thanks to floor to ceiling windows throughout both private and common areas. The best Amazon cruises are those that satisfy your wants and surpass your needs, and our personalized service is there to anticipate the preferences of our guests. This Amazon cruise adventure begins the moment you arrive at the jungle. 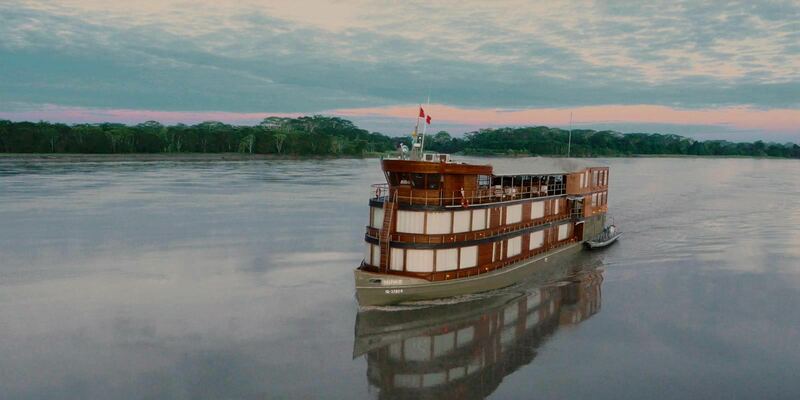 Our vessels depart from either Iquitos, the largest city in the world not connected by road, or Nauta, a historic jungle town. As one of the best Amazon cruises, Delfin continuously searches for the best experiences to provide guests, both on and off the boat, without forgoing modern comfort. A day’s itinerary may include optional activities such as birdwatching at sunrise, swimming near pink dolphins, and skimming the river beneath moonlight to spot caimans. Of course, back on the Amazon cruise ship, gourmet meals inspired by local ingredients, culinary classes, cultural workshops, and endless downtime ensure you can also savor the best Amazon cruise experience from the comfort of our luxury cruise. Delfin Amazon Cruises exclusively operates in the ‘lungs of the world,’ and considers this unique location home. As one of the best Amazon cruises, we are passionately committed to sustainability and aim to lead by example. Guests aboard Delfin will experience a deeper understanding of jungle culture by visiting riverside villages and interacting with locals. From our initial years to our current status as one of the best Amazon cruises, our company has worked with local artisans who supply our boats with decorations and crafts and in return, we are able to support their families and communities. 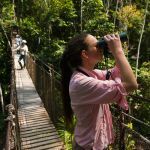 Our jungle walks are in partnership with the surrounding villages, who maintain the jungle and even help us spot local flora and fauna that otherwise would be difficult to locate. 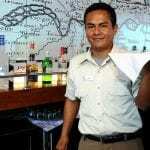 Delfin Amazon Cruises is among the best Amazon cruises in terms of guest experience and smart practices. 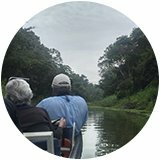 Delfin’s luxury cruise line has earned a reputation as one of the best Amazon cruises and one of the most authentic. This is largely in thanks to Lissy Urteaga and Aldo Macchiavello, the husband and wife team whose passion for tourism organically evolved into a desire to create the best Amazon cruise experience for their guests. 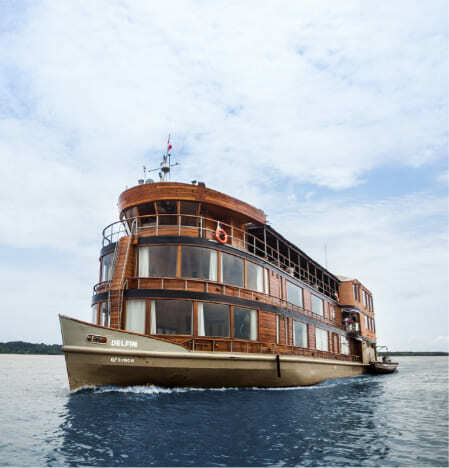 Delfin I launched in 2006, quickly distinguishing Delfin Amazon Cruises as one of the best Amazon cruises because of its commitment in providing luxurious comfort, sourcing local ingredients, artwork and staff, and offering consistently personalized service. 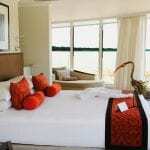 Soon after, Delfin II and III followed, continuing in the line of boutique travel and services. 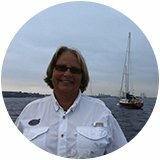 It’s not uncommon for guests to see Lissy or Aldo onboard, lending a hand and ensuring that everything is up to their standards of what the best Amazon cruise should be.